These are the design & color shceme for my upcoming Pony OC, Stella Starlight, a Star-Trek pony. DESIGN 1: This is how I should have draw the mane and tail after coming up with the base design in pony creator. My attempt here was to create an original mane and tail piece that is a nod to Vinyl's and Rarity's - a design based on their mane and tail, but given a more original look and style. For the mane, I simply created more bangs and tried making the hair look just a tiny bit more curved, and made the back and left side of the hair more original by making the bangs longer. For the tail, I went with a design that is also a nod to Rarity's, but given a more zig-zag design, while still making it look twirled-like. This, by any dough, is the final design I'm looking for. DESIGN 2.: Some of my follow deviants suggested that Stella be given a pony-tail, so I went in that direction. Originally, the pony-tail was more a Samurai's pony tail, but I went back and fixed it in the sketch. The hair on top is still that of the other design. This design is simply like Vinyl if she had a pony-tail. For the tail, I with a backwards "Z" for the shape. DESIGN 3: The mane in this design is my least favorite. It makes her look like Rob Schneider's character from <i>Grown Ups</i>. This was my attempt at making her bangs curve upwards, but it didn't turn out right to me. As for the tail, I really like where the design went on it. Again, it's twirled with a zig-zag style. DESIGN 4: The design for the mane is the same as Design 1, but without the extra hair, as a means to base this hair piece off what I originally had for Stella - https://captricosakara.deviantart.com/art/MLP-Stella-St.... The "S" design for the tail came to me from a toy commercial of all places (which just goes to show that inspiration can come from anywhere! ^^). COLOR SCHEME 1: This is the original color scheme I had for Stella when I first designed her by in March - mint-green coat, with sky-blue hair, and rose-colored eyes. I could have added a darker blue for the stripes, but then it would make her look more like a Vinyl Scratch rip-off, specially with the mane I'm using, so I just left the main color at that. COLOR SCHEME 2: This lovely redish pink and violet color scheme was suggested by sonicgirl21 on DA. Originally, she gave the eyes a blue color to go with the cheek mark's color, but I said no blue eyes, so she suggested Hex #df0049 for the eye color. COLOR SCHEME 3: Following the example of Color Scheme 2, I went with making a green-colored variant, using purple eyes to avoid making her totally green (although I could change them to green if it'll make her look better). I like where this color scheme goes, as it follows Rico's all-blue color scheme with his blue captain's uniform. COLOR SCHEME 4: Like Design 3, this one follows Design 2's scheme. This one is a purple variant, with green eyes to match the uniform. COLOR SCHEME 5:This design was contributed by another deviant (who I can't remember who). He/she suggested a dark purple coat with green/light-green hair, and rose eyes. I like where this color goes, but sadly this color scheme could work better on a pony who's special talent is rising egg plants or some other vegetable. Not a space pony. COLOR SCHEME 6: This color scheme was suggested by DarkHedgehog23 on DA when he send in his design - https://darkhedgehog23.deviantart.com/art/Stella-Starli.... Even though I commend him for trying, I seriously think the colors for the hair don't work, as they are a Christmas-themed color, and that doesn't go well with a purple coat that light. COLOR SCHEMES 7 & 8: Schemes 7 & 8 were both suggested by a few other deviants, including X-tatik. Both are basically the same as the colors I had for Stella's new design, only for #7 I gave the tail and mane the same colors, and for #8 I desaturated the coat color a little, and replace the yellow stripe in the tail with purple. I really prefer the original coat color I had over the desaturated version, as the dark violet color made her look more lively. For the stroke colors of the mane and tail, I went with opposite colors as I originally did, as it was meant to be a nod to pyawakit's coloring style. COLOR SCHEME 9: This color scheme is basically Nyx's coat color with the hair color scheme of purplepennie's neon pony, Neon Pop. This is not a final design, but meant simply to give you an idea of the color scheme I'm looking for. Any suggestions for improving the color scheme is appreciated. COLOR SCHEME 11: Now this color is also more toward the neon color scheme I'm looking for. My inspiration for this design was the pony Neon Beat by artnerdem on DA. I gave the coat a more dark-grayish color, and went with white hair for the main and tail, and adding in just greenish-blue/sky blue, and a few strips of lime green for the mane. I also made the eyes greenish-blue to match. The stroke of the mane and tail done in a greenish-gray color. 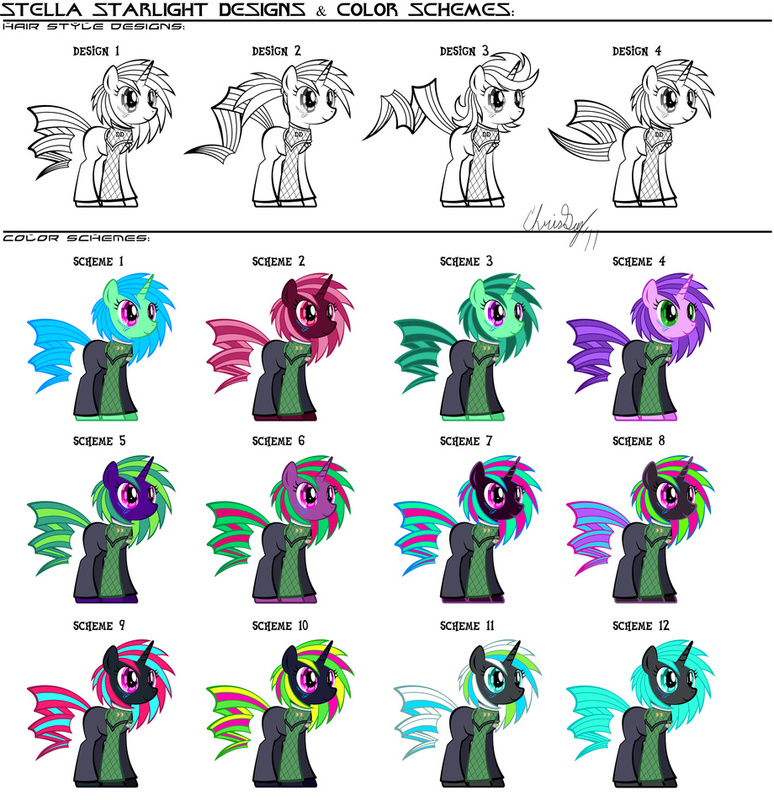 COLOR SCHEME 12: for the finally color scheme, I simply took scheme 11 and made the mane and tail completely greenish-blue and gave it the impression that is glows, giving her the appearance of a <i>TRON</i>-themed pony. With this color scheme, she could be passed on as a TRON pony as a given plus. My personal favorite color schemes are #2, 3, 4, 9, 11, & 12, and I think I'm going to go with one of these schemes for her final color design. As for the hair design, it'll be Design one for sure, as that is what I'm looking for, but I might choose #4 as a 2nd design style. I saw the Star Trek style font, and lol'd. Nice color schemes. I have a hard time coming up with color schemes, myself.